EDGAR RICE BURROUGHS: A CRITIQUE by - Virginia - L. R. Chauvenet - Article - If popular success be considered any indication of literary greatness, then it is impossible to deny such a quality to Edgar Rice Burroughs, whose Tarzan stories and other tales have sold millions of copies in virtually every language spoken by any significant number of people. Nevertheless, examination of ERB's works not only shows that they are far from being what the intellectuals classify as great literature, but may serve to show us the secret of their popular favor. To consider the latter aspect first, let us begin with ERB's first two books -- "The Outlaw of Torn", which was a flop, and "Tarzan of the Apes", which became an immediate success. There is no real difference between the styles of the two works -- in each book, the hero overcomes insuperable odds and rescues the heroine from a "fate worse than death". The setting of the Outlaw, however, is in some part historical ---- specifically, feudal England, when the barons were powerful enough to cow John, the weak king, and every nobleman's home was literally his castle. This background hampered ERB; the terrific feats of his here occuring in historical settings could not but seem out of place. There was a fundamental incongruity of plausible and sheerly fictional events. Perhaps, also, ERB struck at the wrong time. The vogue for historical novels has only reached extensive currency since the w.k. Gone With The Wind, of recent date. AT any rate, Outlaw of Torn did not sell. 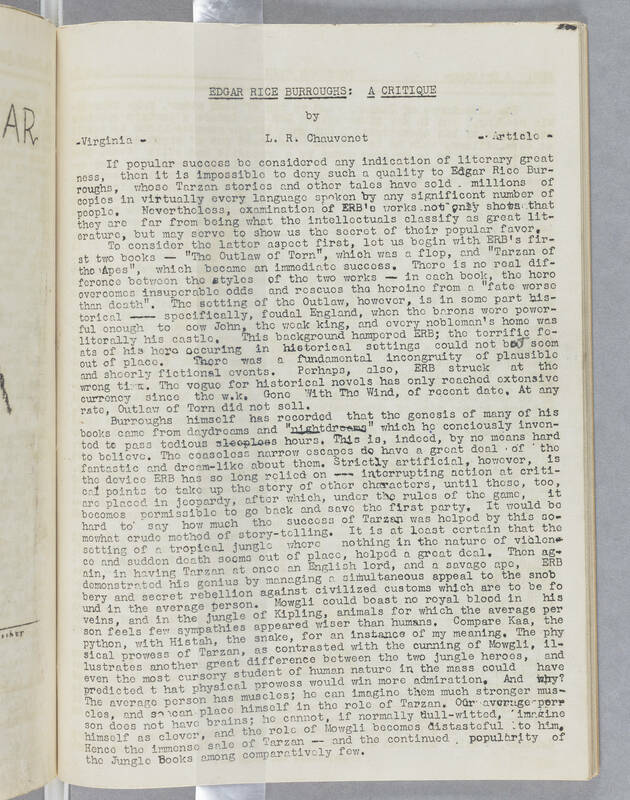 Burroughs himself has recorded that the genesis of many of his books came from daydreams and "nightdreams" which he conciously invented to pass tedious sleepless hours. This is, indeed, by no means hard to believe. The ceaseless narrow escapes do have a great deal of the fantastic and dream-like about them. Strictly artificial, however, is the device ERB has so long relied on --- interrupting action at critical points to take up the story of other characters, until these, too, are placed in jeopardy, after which, under the rules of the game, it becomes permissible to go back and save the first party. It would be hard to say how much the success of Tarzan was helped by this somewhat crude method of story-telling. It is at least certain that the setting of a tropical jungle where nothing in the nature of violence and sudden death seems out of place, helped a great deal. Then again, in having Tarzan at once an English lord, and a savage ape, ERB demonstrated his genius by managing a simultaneous appeal to the snobbery and secret rebellion against civilized customs which are to be found in the average person. Mowgli could boast no royal blood in his veins, and in the jungle of Kipling, animals for which the average person feels few sympathies appeared wiser than humans. Compare Kaa, the python, with Histah, the snake, for an instance of my meaning. The physical prowess of Tarzan, as contrasted with the cunning of Mowgli, illustrates another great difference between the two jungle heroes, and even the most cursory student of human nature in the mass could have predicted t hat physical prowess would win more admiration. And why? The average person has muscles; he can imagine them much stronger muscles, and so can place himself in the role of Tarzan. Our average person does not have brains; he cannot, if normally dull-witted, imagine himself as clever, and the role of Mowgli becomes distasteful to him. Hence the immense sale of Tarzan -- and the continued popularity of the Jungle Books among comparatively few.